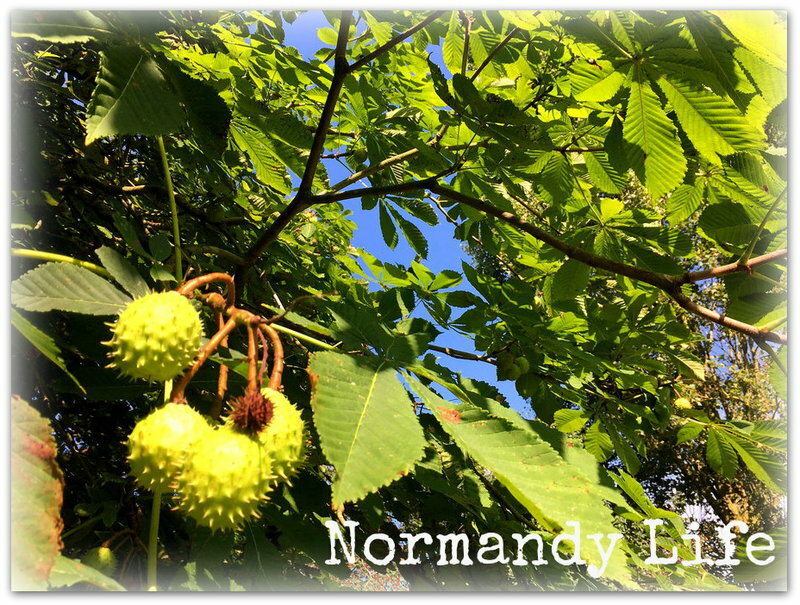 Normandy Life: Mosaic Monday # 68 - Five on Monday. Mosaic Monday # 68 - Five on Monday. There used to be a weekly meme, which I always enjoyed being a part of, called Five On Friday hosted by Amy @ Love Made My Home. A while ago Amy took a break from blogging but I'm happy to tell you that she's blogging again so please stop by and say welcome back, Amy! For my MM post today here are 5+ things that happened here recently. New Year - new haircut! You may have seen on the news that Storm Eleanor brought the New Year in with more than a few bangs as thunder, lightening and gale force winds ripped across Normandy. 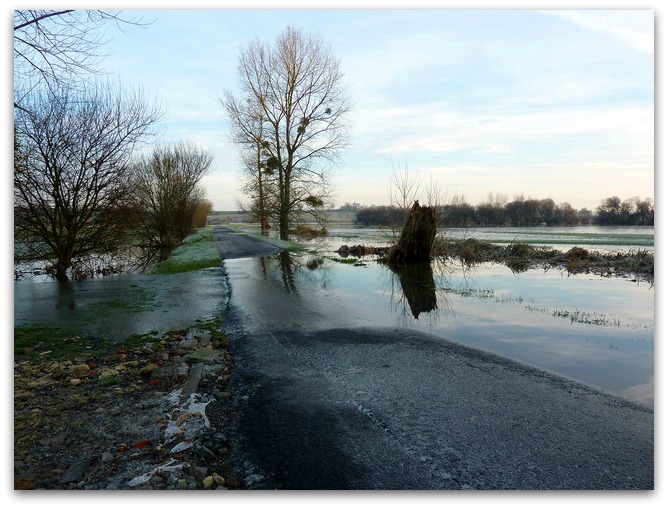 The village which we live in sits on the edge of the Marais (marsh) National Park and some of the fields where cows and sheep graze in summer are completely under water, the French for flood is "inondation" and signs are placed at the roadside when the road between the fields are impassable. After a couple of days Eleanor went away to continue wreaking weather havoc in the UK . Whilst she was gone the weather here was so mild that the SP got the mower out and gave the lawn in front of the house its first haircut of 2018! Eleanor wasn’t finished with us though and our beach walk a few days later had to be cut short as we got sandblasted and buffeted by the wind. Later that evening we enjoyed a cosy dinner for two in front of the fire. 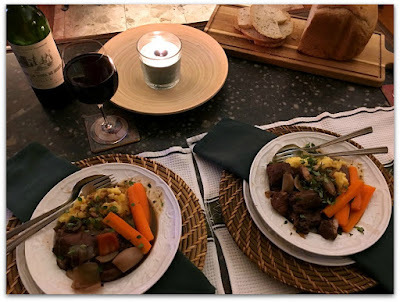 The SP's signature dish of coq au vin and root vegetable mash with carrots on the side, afterwards we settled down to watch a new drama series on TV. January is the month that UK TV companies launch new programmes and there are two in particular that we’ll be watching this month, the BBC’s Hard Sun and ITV’s Kiri. Both feature strong women in the leading roles, Aygness Deyn (Hard Sun) was born in the town of Littleborough, Lancs, which is about 15 miles from Oldham where Sarah Lancashire (Kiri) was born and coincidentally also the town where I was born and raised. Finally, a book recommendation for all those who loved Downton Abbey - “Belgravia” by Julian Fellowes which I thoroughly enjoyed reading this week. Julian Fellowes's Belgravia is the story of a secret. A secret that unravels behind the porticoed doors of London's grandest postcode. Set in the 1840s when the upper echelons of society began to rub shoulders with the emerging industrial nouveau riche, Belgravia is peopled by a rich cast of characters. But the story begins on the eve of the Battle of Waterloo in 1815. (text from Goodreads). We heard about storm Eleanor, and are glad to see that you didn't suffer much damage from it. How soggy the fields must be. Your coq au vin dinner looks delicious. You look very chic with your new haircut. I read Belgravia this past year and thoroughly enjoyed it! Thanks for hosting. I was a big fan of Downton Abbey. Will look out for “Belgravia”. Hi Maggie'Your new haircut is very pretty! I'm sorry to see all the flooding there. I know many areas in Europe are having unusual weather this winter, as is the US, We've been unusually warm and dry in my part of Colorado. The new TV series sound good and so does that Fellowes book! Your new hair do looks lovely. Thanks for the title of a new book to read, I’ve been missing reading whike away fir 5 weeks and we are off to the library thus week. Our weather has been chsngeabke and we’ve had a couple of wintery storms so far in January. Have a good week and I hope you can enjoy some beach walks. Inondation indeed (that word makes perfect sense without translation)...I’m so sorry about rhe storm ...water and wind. Being caught in blowing sand sounds awful. But how yummy and cozy your dinner by the fire ...and I’ll expect to see both those shows on Netflix eventually. Pretty much all we watch these days are from BBC . Putting the book suggestion on my Kindle list! And I like the new look for the New Year! Love your hair cut. Cute! Your dinner looks yummy. Gosh -- I think it doesn't matter where you live, the weather is just nuts! Happy Monday and thanks for hosting! Maggie, thanks for the book recomentation. I'm going to look for a copy today. I watched the first episode of Victoria Season 2 last night. So excited for this to start anew, and better yet, that season 3 is in the works. Love the new haircut! You look fabulous! The mosaic with the ovelay of plates is fantastic. How did you do that? First of all, compliments to the senior partner on that fabulous looking coq au vin! I love that dish! And second, great cute hair! And I love Sarah Lancashire! AND, don't go beach walking in the wind anymore -- not good! Good morning Maggie, we have sunshine today (after 2 days of fog), always perks up my the daily work. Love your haircut. Thank you for your 68th Mosaic Monday, always enjoy meeting others at your party. Your haircut looks fantastic! The food yummy! I am watching amazon series called the Last Post abouy 1965 Britain in the middle east . Maggie, Love the new haircut. The weather seems to be challenging all of us across the planet. The lawn looks very green! Thanks for sharing and hosting. Sylvia D.
We are currently enjoying the rain from the ex cyclone Joyce. Very much appreciated to wet down the scorching earth, and also put out a raging bushfire near our capital Perth. Have a great week. That food looks very tasty! 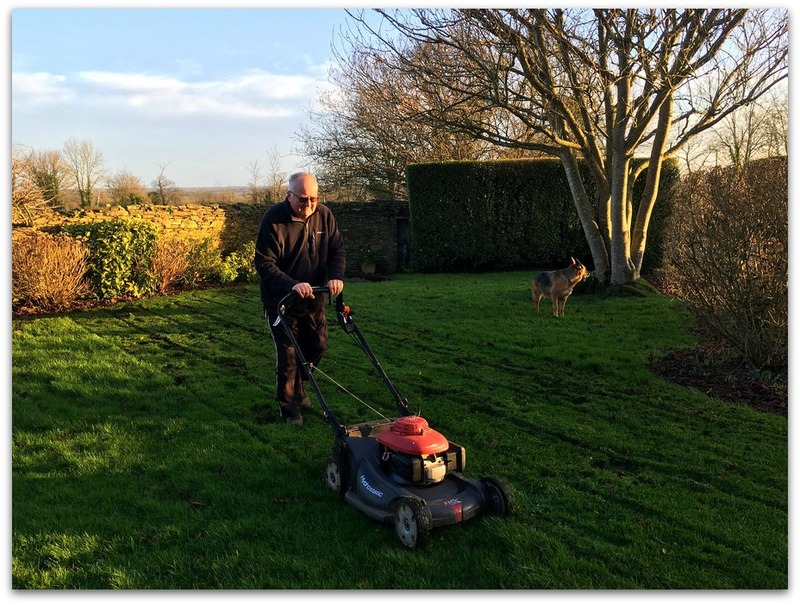 Maggie - I simply cannot imagine that your lawn needs to be mown - in January! Here, we have snow as far as the eye can see! 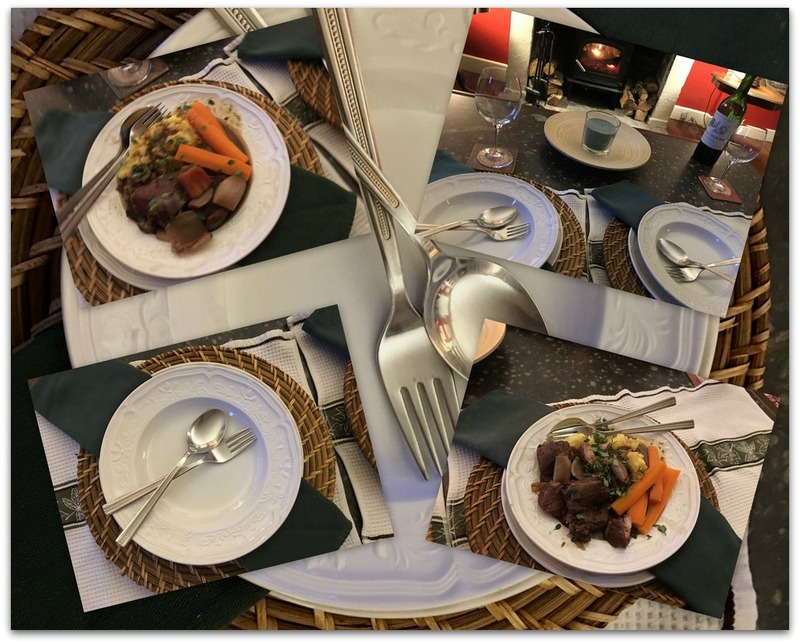 Your pictures of SP's meal broadcast "delectable". Do you take reservations? I have made a note of the new TV programs and Belgravia - always looking for entertaining material! Thanks for hosting! Food looks yummy! Beautiful haircut! Those storms can be so scary. Love your new haircut Maggie. That's a great pic of you Maggie - looking younger than ever!!! 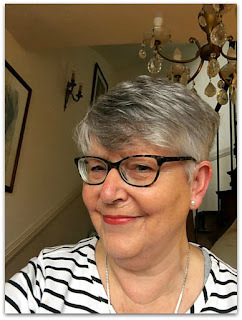 These days I feel 'messy' as I'm growing my hair a bit - it may not last though and I'll have it cut off again!!!! Hope your weather has improved - we had 7"of beautiful snow on Tues. Much has melted and now with more sunshine and warmer temps. today we should be able to get out and about again soon! Reading about the cozy dinner by the fire while you began to watch "Belgravia" gives me hope that the series will be available on Netflix one day. I miss Downton Abby! Amazing to see your husband mowing the grass at this time of year!